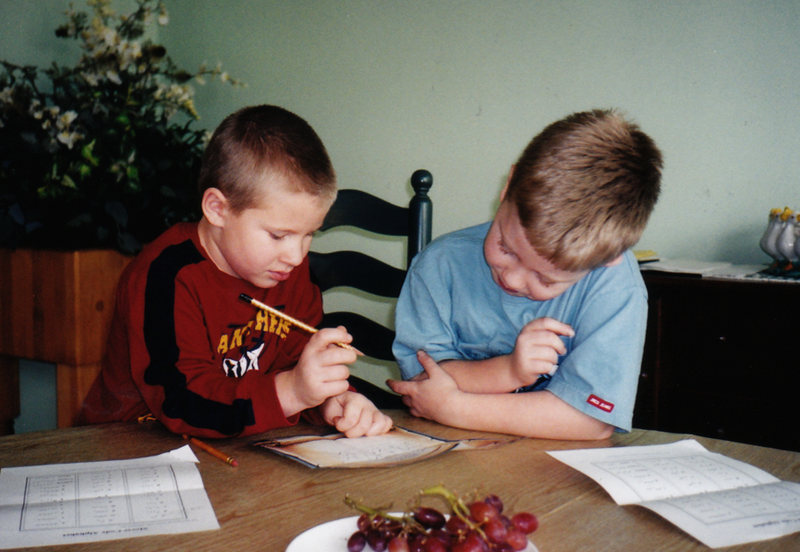 Kent and Ross as young boys, breaking a code. Yesterday, in presenting my Saturday Fun Activity "Where IS This?" photo contest, I asked readers if they were tiring of it; I guess that means I am, a little. Or at least I was on Friday night. Most people said they enjoy it, so it'll continue, for the time being. I try to be a full-service columnist. A few said they wouldn't mind a trivia question, along the lines of the opera trivia contest I used to pick readers to go to "Porgy & Bess" in December. Though they wondered if questions could be devised that would thwart easy solving on Google. That's a challenge, and I'm going to work on that. In the meantime, what strikes me as being more Google-proof is not trivia, but logic questions, particularly original ones. When the boys were small, I used to devise puzzles to occupy them, codes and riddles and ciphers, as part of elaborate scavenger hunts I would create to help keep them occupied while I was away on trips. Here's an example. A bright 8-year-old could crack it fairly easily, so I assume someone out there can too. The first person to answer wins a bag of fine Bridgeport coffee. ("Prizes! Prizes!" cry the Caucus Race creatures in "Alice in Wonderland." Because really, what's the point of a contest without prizes?). Good luck, and post your answers below. Oftentimes I will think about the alphabet to get to sleep. One night, I sorted letters in such a way that I had a string of 15, with the other 11 not belonging. From that string, I took away another seven, as a challenge to you. Can you recognize the commonality of the remaining eight letters, and supply their missing seven brethren? Don't bother with Google—it won't help you. You have to think. There's no rush; yesterday's puzzle wasn't solved. I'm hoping this won't be either. the other letters that belong are: E H K M T W Y. the one that do not are: B C D G J O P Q R S U. the group of letters you selected are all made up of only straight lines. Aww, that's what I was going to say! That's it, Scott. Congrats. Send your address to me at dailysteinberg@gmail.com and I'll send you your fine Bridgeport coffee. Congrats. KNEW! THINg! ANd! INcLudEd! 4 MIsTAKEs, AT LEAsT... d'oH! I was going to guess they're the 15 letters that you didn't arbitrarily throw out. But the straight line thing, that makes sense, as well.